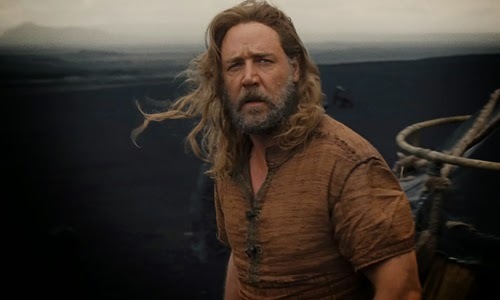 Going into Noah with the expectation that Darren Aronofsky's going to color within the lines of gospel would be a mistake, though it's understandable why some might expect him to do so. The name Noah in itself and the premise lying underneath his narrative are, after all, modeled from a brief, fantastical story told in the book of Genesis (and also appears in other religion's texts), which Aronofsky became interested in at a very young age. What he sees in the parable will differ from the way others view the saga of the great flood, though, and the man tasked by a higher power to build an animal-preserving vessel worth weathering it: Aronofsky embraces the line between devotion and madness, the harshness behind purging all life from the planet, and the haunting moral conflict in standing by and observing the benevolent creator's judgment. There's a lot of room for interpretation around "Noah's Ark", and Aronofsky uses that freedom to craft a mesmerizing vision with a flexible grasp on spirituality and the integrity of mankind, though it's also an unsubtle tonal departure that won't be for everyone. Noah begins with antiquated title cards and brisk stylistic flashes into the origin of humanity, introducing us to the three children born of the Garden of Eden -- Cain, Abel, and Seth -- and how the desirous and destructive side of humans led to Earth's corruption, like a more malignant and unsustainable form of urban sprawl. The descendants of Seth, however, safeguard and nourish the world outside the corruption's reach to the best of their ability, a task passed down through generations as they survive on only what's absolutely necessary from the earth. Noah (Russell Crowe) marks the last of the lineage (along with his children), living off the land with his family as wanderers in the sparse landscape, revering the Creator's design through a pure life. One day, Noah receives a mystical sign from above in the form of a raindrop which immediately manifests into a flower upon hitting the ground, followed later by haunting visions of a great flood, the purging of mankind, and the preservation of the Creator's other creatures to begin again. The message becomes clear: Noah must build a vessel to house the beasts, else they'll meet the same fate as the lost humans. The uniquely hued and unsullied expansiveness of Iceland provides an ideal setting for Noah, which is very much the work of the filmmakers behind The Fountain's philosophical whimsy and sensory splendor. Aronofsky approaches the concept like a pseudo-apocalyptic fantasy allegory instead of strict adherence to religious intentions, without any real way of distinguishing chronology without the viewer's meta-contextual input. Lyrical cinematography guided by Black Swan's Matthew Libatique, coupled with Clint Mansell's expressive score and precise visual effects that bolster its dreaminess, enriches that otherworldly essence of the setting through stark silhouettes against ethereal skylines (reminiscent of Nicolas Roeg's work), hikes through the disintegrated ruins of unsuccessful civilization, and sharply-edited time progressions of an evolving stream within the landscape. The organic, desolate atmosphere convincingly sets the stage for a clash between preservers and consumers of the gifts bestowed to them, along with the presence of the Watchers, gnarly rock monsters punished for their prior intervention in the affairs of man. 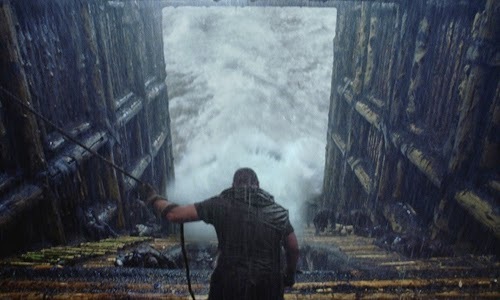 Aronofsky and co-writer Ari Handel have shaped the central conceit behind Noah into a versatile, somewhat cryptic composite of the customary versions of the story and fanciful divergences, an attempt to make it accessible for both the devout and the skeptical as a piece of dramatic entertainment. Opportune magical touches elevate the fantasy milieu, from the inclusion of mystical rocks used for igniting fire and shamanic medicine to sedative smoke for the animals aboard the ark, which uniquely work around situational problems. They've done the same thing with their vision of the "Creator", too: a benign yet restrained omniscience whose participation in the events leading up to the flood have been carefully kept at bay to elevate the human aspects of the story, without diminishing his importance or the reverence displayed by Noah's family. A fusion of theology and pragmatism underneath the Creator's touch takes shape as a result, while forging a film that's spiritual without being specific. 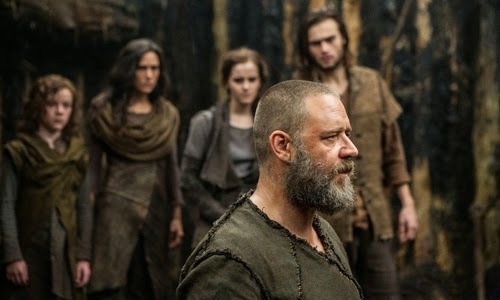 An austere balance between faith and personal perception arises in Noah, allowing Aronofsky to comment on the nature of belief as the descendant of Seth constructs a vessel specifically made for not saving human lives. Russell Crowe admirably sculpts his transition from a self-possessed druidic protector to a burdened man whose faith isn't allowed to falter, crafting a solemn persona that gradually simmers as his resolve gets pushed almost to a point of zealousness. The characters' reactions to his descent are potent and nuanced, if a bit one-note. Jennifer Connelly provides an ample and sympathetic offset to Noah's steadfastness as his wife Naameh, while Logan Lerman gives his middle son, Ham, a certain hangdog self-interest that works well with their clash over his livelihood following the flood. The conflict created over their adopted daughter, Ila, and her place on the ark is emphatically embraced by Emma Watson, too, while his father Methuselah's sagely interjections and light comic relief are properly aged by Anthony Hopkins. Perhaps the most challenging element of Noah comes in its depiction of the wickedness and entitlement of humanity -- the purpose behind the Creator's purge in the first place -- which often goes blissfully overlooked in other harmlessly jubilant representations of the material. Helmed by Tabul-cain, with Ray Winstone uncannily channeling Mickey Rourke, the abandoned souls of mankind are painted in broad, discomforting strokes through the temptation of violence and the degradation of their moral compass, lending fuel to the film's blockbuster scale once the time of the flood arrives. Granted, its obligation towards the epic scope of a battle reminiscent of LOTR's Helm's Deep feels somewhat cumbersome; yet, there's weight in its thematic purpose, supporting the Creator's judgment and offering a gradient of virtue based on the innocents caught in this melancholic grand design. Giving the deviants a face and a voice becomes the ugly side to the great flood that, despite the film's tone rushing in a severe direction, feels vital to appreciating the importance of the story itself. It took bravado for Darren Aronofsky to get his hands dirty with an above-$100m project focused on the hazards of higher-being belief and the ugliness of human fallibility and egotism, yet he makes every penny and moment count in the moral spectacle of it all, cresting higher once the flood arrives. There's no denying the uptick in bleakness once the magnificently-constructed ark has shuttered its doors, where the liberties taken by the writers manifest into harrowing conflicts built around interpreting and undermining the Creator's goals. However, there are also rays of hard-earned faith in human nature and perspective once Noah rides out the storm and reaches its destination, rewarding the rollercoaster ride with bittersweet, intimate moments of catharsis and resolved turmoil that I'd like to think will resonate with both believers and cynics. There's a lot of breathtaking ambition crammed into this liberal reimaginging of a short segment from scripture, and while it's not watertight in its emotional integrity or indulgent blockbuster inclinations, there's a lot of distinct, fearless beauty to behold.